Microsoft Access 2016 did not receive a facelift from the 2013 version. What did change in Access 2016 is many of the features found under the hood. Access 2016 offers some new features. Microsoft Access is a Database Management System (DMS) that is used to create software applications for Windows formatted (FAT32) computers. Because of the nature of the application, Microsoft saw no reason to create a Mac version of the product. 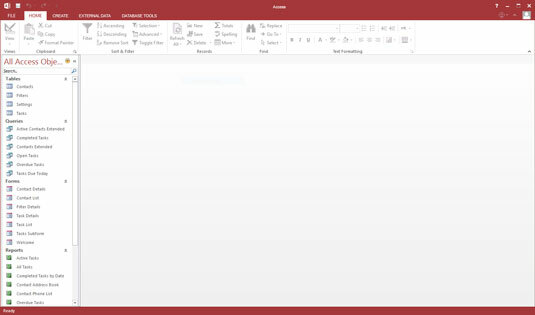 Sadly, if you are using an Apple computer and want to use Microsoft Access 2016, you will have to do so through the Office.com website — armed with an Office365 Subscription. Keep in mind, if you are using the Home or Student version of the Office 2016 Suite, Access will not be available to you. Access 2016 is available in the Pro and Business versions as well as sold separately. If you are an Office356 subscriber, then Access 2016 is available for download by entering your 365 credentials (PC only) at the Access download page. Users can now create forms, queries, reports, and tables easily with the help of the Tell Me function built into the applications search bar. Since Tell Me is the modern replacement of the old paperclip assistant “Clippy,” you can easily get the help you need by clicking or tapping the question mark and typing your query in the search box in the top right corner of the application. Access 2016 has modernized and simplified the templates available to you. This means that it is now easier to create your databases and convert them into stunning custom applications without the need for knowledge in computer programing. You can easily access the templates page and choose the appropriate template you want to work with from the startup screen. Keep in mind that if you are already inside the application and want to open a new template, click or tap on the File tab in the top left corner of the application. If you are unhappy with the color of the ribbon on the top of the Access application, you can choose to change it to white and even set graphic backgrounds just like with the 2013 release. You can click or tap File→Options→General and choose the style that fits your needs. You now have the ability to, without effort, export all your linked data to Microsoft Excel 2016. This feature is especially helpful if you have a large amount of linked data from several different sources. Excel will create a list of the data links and sort it by type for you so make huge databases a lot easier to manage. To access the Export function, click or tap the External Data tab and then click or tap on the Linked Table Manager button. A pop-up window will appear; select all appropriate links and then click or tap on the Export to Excel button to the right. As soon as SharePoint 2016 releases, you will have the ability to export many of the Access 2016 features to SharePoint as well. Now in Access 2016 the sidebars and pop-ups can use the size relationship of the application to their advantage. You can see more lists of tables and query names in your database without much scrolling or tab navigation. Since the new Office Suite is a collaborative “living” set of applications, feedback is important and impacts the development of features that will be added to the Office suite in the form of updates. If you want to see improvements on features, click or tap on the smiley face in the top right corner and explain in detail what you would like to see changed.